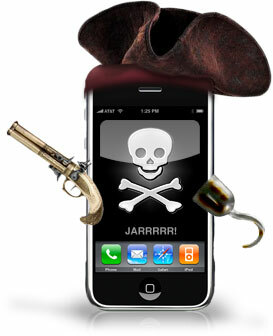 First we had Crackulous, and now as is the case with any sort of media today, piracy is running rampant. It is something that is bound to happen no matter how many ways are created to prevent it. DVD's, CD's, Satellite TV, Video Games, and now iPhone applications. According to Wired.com nearly 20% of all the App Store apps have been pirated and are now available. One torrent file of 5.4 gigabytes worth of apps, 808 cracked apps to be exact, was recently floating around on the web. It's all out there to grab... but it doesn't make it right and no we won't tell you where. blockquote>"We want people to think of these as trial apps since Apple doesn't allow trials of apps before purchase," said "Omar," one of the creators of the site, who refused to disclose his real name to Wired.com. "It's Apple's fault for not putting up a trials system." Has "Omar" ever really been on the App Store lately? There are lite versions all over the App Store and that rests in the developers hands whether or not they want to make that available, but certainly that is not Apple's fault. Right? Either way, this is getting out of control just a bit, I mean you have pirates pirating other pirates now! So who really is to blame for this piracy gone crazy in the App Store? Apple? Developers? Let us know where you stand on this one!